In a large saucepan, heat milk and cream over medium-low heat, stirring occasionally, until bubbles begin to form at the edges (the temperature should be around 170 degree). In a medium size heat-proof bowl, whisk the egg yolks together. Then, whisk the sugar into the yolks until the mixture thickens and looks pale yellow in color. Temper the egg yolks by slowly adding some of hot cream and milk mixture into the yolks while whisking continuously. (I usually add a couple of ladles, roughly 3/4 cups of the hot mixture into the yolks.) Scrape the custard into the saucepan and cook over low heat (do not bring to a boil). Cook, stirring continuously with a wooden spoon or rubber spatula, until the custard is thick enough to coat the back of the spoon. It should reach a temperature near 185 degrees. Strain the mixture through a fine-mesh sieve into a large bowl. Let cool to room temperature, then refrigerate overnight or until the custard is very cold. Right before churning in your ice cream maker, gently whisk in the peppermint extract. Churn gelato according to manufacturer's instructions, adding the Thin Mint cookies at the very last minute of churning (you could also fold it in by hand, using a rubber spatula). Transfer to a storage container and freeze overnight before serving. wow it's already ice cream time? It looks really creamy and smooth! haha - ice cream has no season, Angie! ; ) I've been churning all year long. You had me at mint ice-cream. And now you have me wishing I could take that scoop through the screen! YUM! haha - mint chip is one of my favorite flavors...Thin Mint cookies aren't too bad either. Yes, the fact that it's lighter is like a bonus. I love how much more intense the flavor is with gelato. Thin mints and the ones with the peanut butter (that I can't remember the name of right now... lol). This ice cream sounds sooo good! I eat ice cream all year round but with the weather getting a bit warmer I definitely want it even more! Have a great rest of the week Monica!! You can't go wrong with adding some Thin Mints to ice cream, right? ; ) Have a great weekend! OMG. 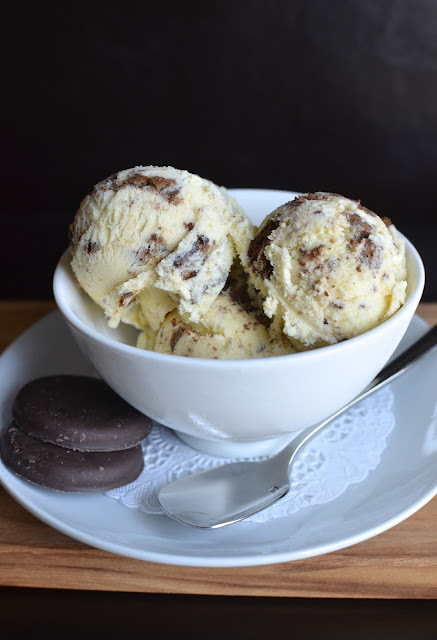 Thin mints are my favorite cookie and ice cream is my favorite dessert. DROOOOLING. haha - I do love this 2 parts milk; 1 part cream custard base so I use it a lot. You are so right about enjoying the cookies cold. It works. Have a great weekend, Monica. Hi Monica, oh I love those little cookies, great idea to incorporate them into ice cream. There is always a small tub of gelato in our freezer, my fav. Should start making my own I bet it is so much better. Looks delicious! I want that right now :-) Looks so creamy and super delicious dear! Thanks - ice cream is so hard to resist! I have never had thin mints, but they look insanely tasty. And I love a hint of mint in ice cream! Thanks, Mariana. Thin Mints are these chocolaty, crisp, peppermint cookies...pretty fabulous.